24 x 20. (60 x 50) Space 18 inches (45 cms) apart. Clump-forming, erect habit with RHS AGM award. Upward facing variety with large, white flowers with just a slight hint of green where the petals overlap. The stamens are orange. In bud it has a slight pink tinge to it. 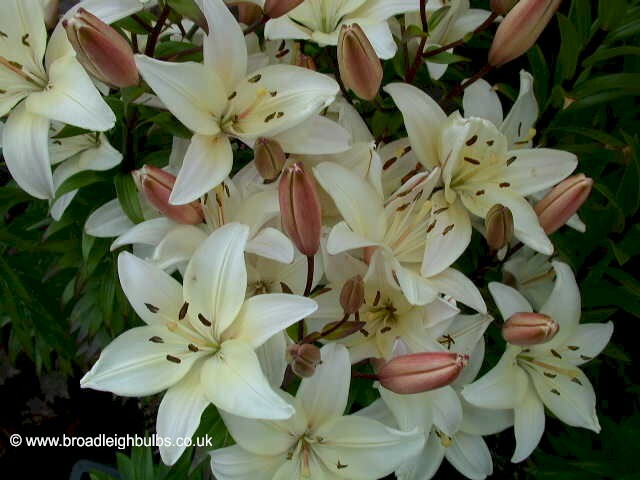 Particularly well suited to growing in pots as this is a very sturdy variety. Flowers in June / July. Height: 70cm (28”). " from R. V. Roger.